An alternative to Iiki-chan (hence "Alternative Voice"). Strict and grumpy, gets angry very easily. Alto rarely smiles because she doesn't understand when she is supposed to. Most of the time she is seen with a calm face. You can find her smiling on a rare ocasion when she takes care of her small flower garden or feels truly happy. Alternative Voice is an android designed to help and serve people. Being a first test model, she developed her own personality and mind. Instead of being kind and friendly she ended up being grumpy and strict, angry at times. Alto was ment to be reset, but she managed to escape and ran away. Alto rarely smiles because she doesn't understand when she is supposed to. Humans can smile when they are happy, sad, angry or just pretend to smile and Alto can't understand why they can't choose only one option. Most of the time she is seen with a calm face. Iiki told Alto to smile only when she is truly happy, so you can find her smiling on a rare ocasion or when she takes care of her small flower garden. Alto lives together with Iiki-chan in a rented appartment, does part time jobs and takes care after her new little sister. She gets very angry every time Iiki-chan gets into troubles. Alto's character design is very simple: jeans, sweatshirt and sneakers. 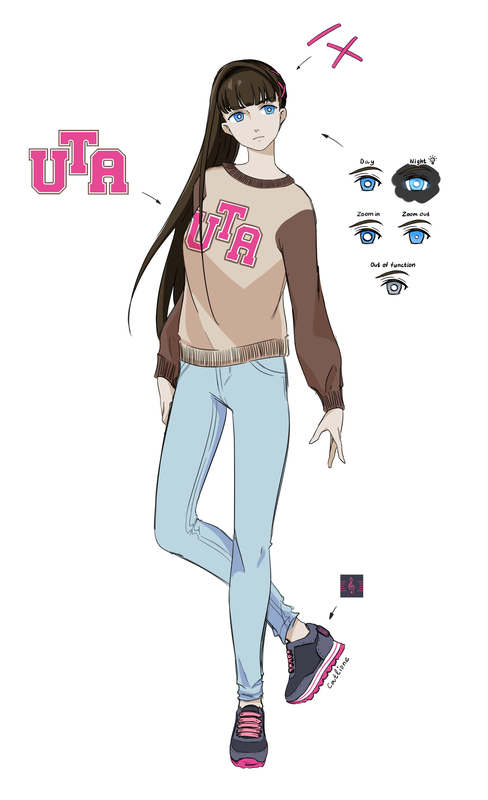 Her sneakers follow an UTAU logo color scheme. Alto's hair is fliped on a left side and secured with hair clips on a right side. A multipitch voicebank recorded with a female and mature voice with light russian accent. This article is written and certified true and correct by the author of the character. Please, don't edit/change anything.